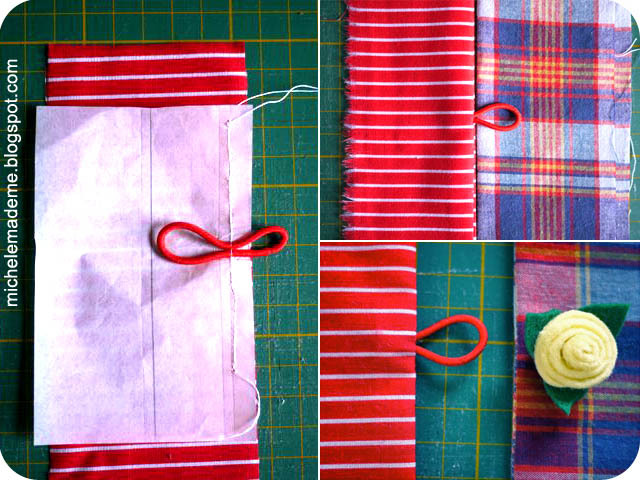 It's time for another wonderful Sewing 101 post! I'm delighted to welcome Michele from Michele Made Me. I twisted her arm into helping this month. She is SO creative, and makes amazing things. Take it away, Michele! Disclaimer: Somehow I cleverly managed to get myself into guest-posting for Chris' immensely practical Sewing 101 series. I'm honoured as Dickens to have a chance to occupy this space even for a millisecond. But it's just that... well... honestly... I don't consider myself much of a sewist. Oh, I'm not saying I don't sew. I DO sew. And I like it! But like a lot of people, I sew in a sort of haphazard, trial-and-error (emphasis on the error), bull-in-a-china-shop, learn-as-you-go kinda way. 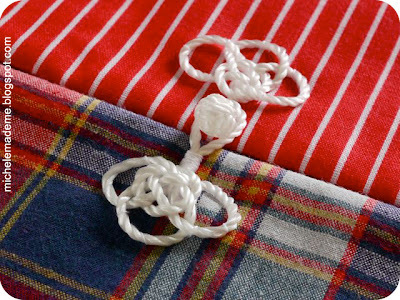 Sewing to teach people? That's a different spool of thread altogether. So I decided to tackle my post from the point of view of a learner. In other words, I'm sitting at the front of the class figuring these things out as I go here. As a result, I will be sending you hither and thither to a few really great tutorials. Are you ready? Let's learn something! 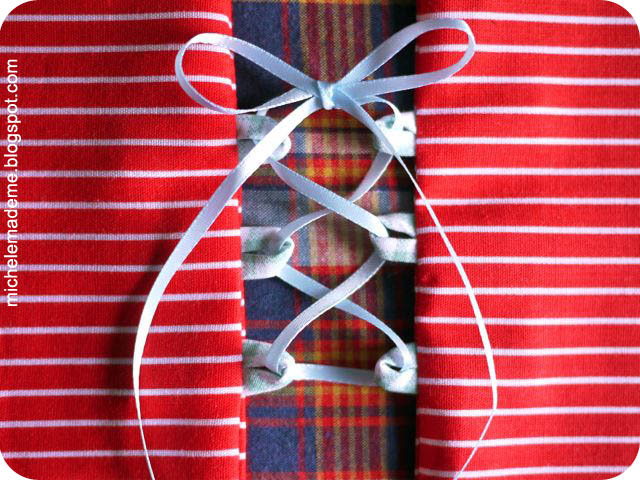 So I've chosen to explore the "ins and outs" of the loop closure as an alternative to buttons and button holes, snaps, and other closures, so that we might add it to our bag of sewing tricks. The loop closure is simple. Essentially, it's made up of two elements: 1) the loop, and 2) what I'm going to call "the anchor". See? I'm making stuff up already... As part of my learning, I decided to try my hand at a few loop closure variations. First, I visited The Sewing Diva. 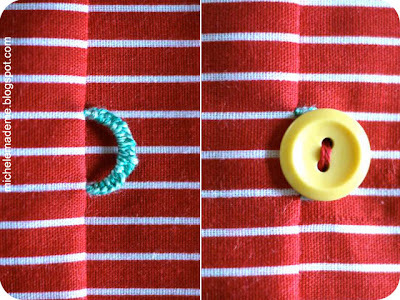 Her button loop tutorial tutorial showed me how to make the most basic button loop closure. The process photos I include below are only to prove that I actually tried doing it for real. The Sewing Diva will show you the way. 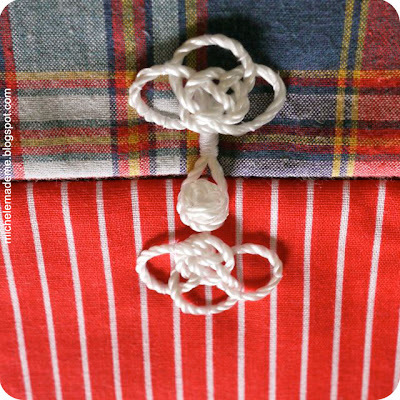 Just let me add 2 small recommendations to the info The Sewing Diva provides: 1) to get the perfect button placement once you've sewn in the loops, mark the button locations through the loops and stitch the buttons in place. And 2) to make the loops themselves, make tiny fabric tubes using the highly recommended "Turning Tubes of Fabric" trick from Pattern Review and go from there. I will say this for the basic button loop. Of the variations I tried, this is by far my favourite. Once you've learned the trick to lining everything up properly, it is quite simple and the results are so pretty. Not only that, but it won't take long to perfect. The following result was my very first attempt. Not too bad eh? Only a little bit off. I still think it looks pretty. Next, using the very same method as in #1, I decided to try putting a series of loops on either side of an opening, and have it lace up like a pair of shoes. You've no doubt seen this concept on vests and dresses to allow for growth or cinching. But I could imagine using this variation as a small-scale decorative element on the flap of a messenger bag maybe, or on the back pockets of girl's pants even. Wouldn't that be cute? Again in variation 2, I used the handy "Turning Tubes of Fabric" trick from Pattern Review to make the loop fabric. Elastic hair ties make great stretchy loops. For my third loop closure variation, I started by making a felt swirly flower. Dozi Design shows you how to make swirly flowers here. I made my flower out of felt instead of paper, secured it with several stitches, stitched on some leaves, and paired my flower with an elastic loop for a sweet decorative closure. I used the very same method presented in #1 and #2 for installing the loop. The possible uses for this closure are many and varied. Think belts, bracelets, needle cases, journal covers, bags and more. The stretchiness of the loop allows for firm closure and permits the use of bigger and odd-shaped anchors. For example, instead of a flower, why not use something else entirely? Like a painted wooden cutout or a crocheted bobble? Just make sure your loop is long enough to stretch around your chosen anchor. Variation #4: Chinese Frog and Knot Before writing this post, I had seen "frogs and knots" on oriental dresses and silk bags. You can purchase these closures ready-made in sewing shops and online. But guess what? You can actually make your own too! 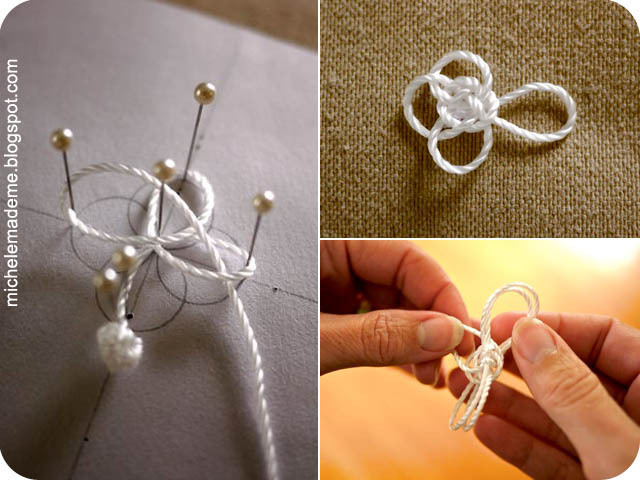 Bridges on the Body has a beautiful Chinese frog and knot closure tutorial that will allow you to make your very own closures to match your particular project. Truthfully, it took me many many - probably about 15 to 20 (I stopped counting after awhile...) - tries before I got these to look anywhere near authentic. But to be fair, I was using the wrong type of cord at first: a small crocheted chain that I'd made. Bad idea. To be successful, you need the type of cord with a high coefficient of loopiness. In other words, it's gotta hold its loopy shape and resist flopping and folding. Once I figured that out, the frogs were much easier to make. Also, after so many tries, the method is etched forever in my little brain. But it is an elegant process once you know it. I'm very glad I learned it! And finally, the fifth variation that I attempted was this embroidered loop. I learned how to make it from Ysolda. 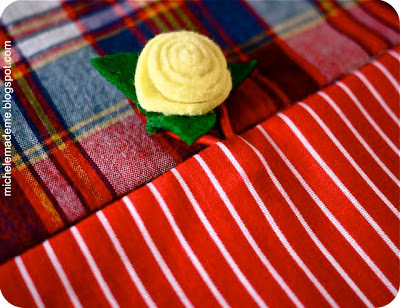 Ysolda's button loop tutorial perfectly explains the easy steps to create this simple embroidered loop. It seems to me this variation would be perfect for a small subtle closure, one that you hope won't be too obvious. And there you have it: my round-up of five loopy closures. Hopefully you will find it useful or, at the very least, feel encouraged to learn about a different closure! I certainly did. I'm sure whole new neural pathways have formed in my brain as a consequence too. And it didn't even hurt! Come visit me at my blog, Michele Made Me, for all kinds of craftiness. I'll show you how to make some amusing things: your own covered buttons from scratch for example, or a pincushion out of a toilet roll, or maybe a fridge photo magnet display out of denim. Drop by anytime. I would love to have you! Thank you sweet Chris for letting me prattle on about loopy closures on your lovely blog today. I learned something new by doing it and hopefully your readers will too. Have a great day! How fabulous is this? 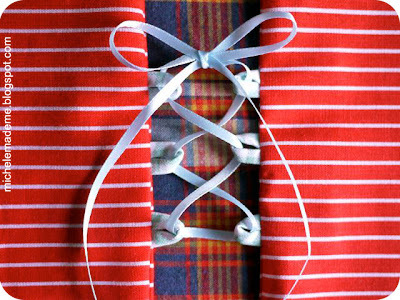 I love using loop closures since making the Portfolio dress...and you can use them in so many different projects! Thank you so much, Michele. I first found you through the covered button post...and have been a fan ever since. 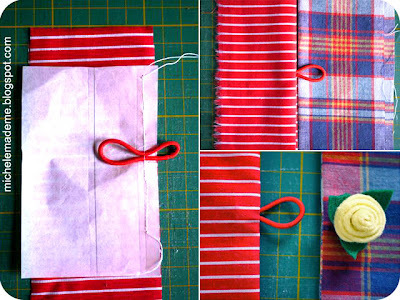 This is a fantastic topic and instructable for the Sewing 101 series. I have been very interested in trying loops for a corset, so the timing is perfect. Loops are so exciting and they really add a special touch to a project. I cannot tell you how much I love your post Michele. About a year or two I had a dress requiring the frog closure. Well, let me just say it was a horrific experience I laugh now when I think of it! Thank you for sharing your tips! What a comprehensive summary! Thanks for all the links. Now it's time to dream up some projects. Thank you so much for the kind comments! I was so glad to be able to contribute something to this awesome series. It was very kind of you to have me over Chris! 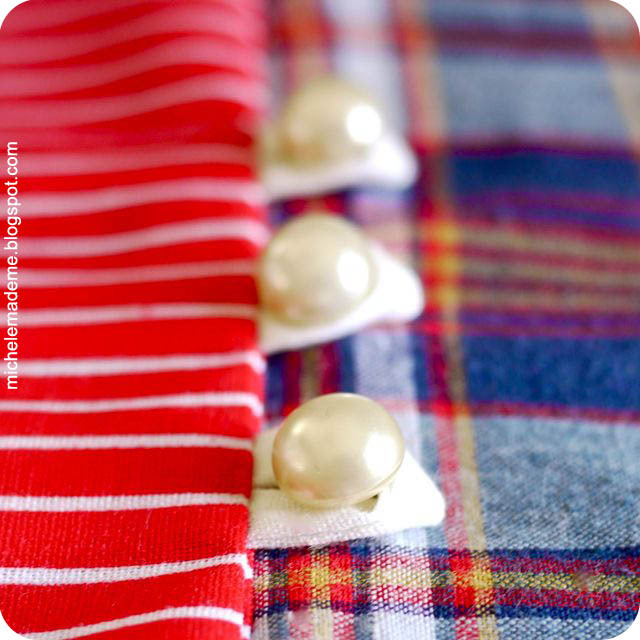 I wish I was brave enough to even attempt sewing--this tutorial looks wonderful! Great job!! Thank you for your sweet comment on my fall crafts, I really appreciate it. Great job, Michele! Thanks for all the links and for trying out all of these methods for us. Your frogs look awesome. those are some great button loops! i will definitly give a few a try. 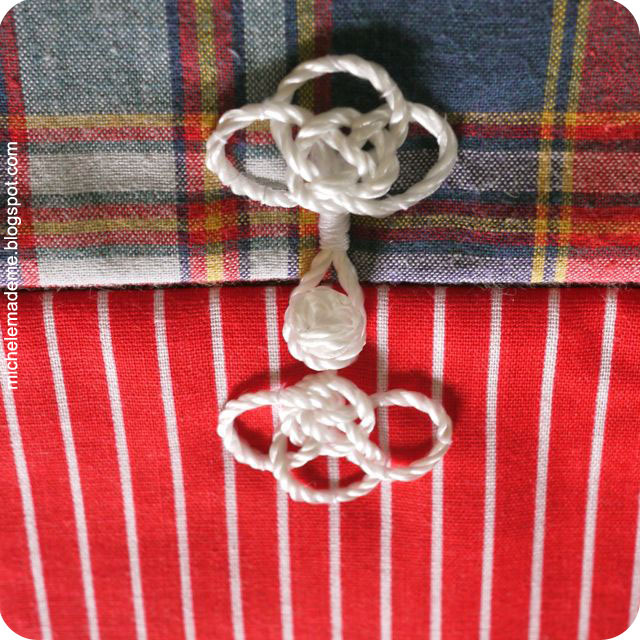 Great ideas, I love the button loops and have just the project for them! I just discovered your Sewing 101 series and I LOVE it!! I am a fairly new sewer, about 4 years now and self taught, so I love reading practical sewing info! Thank you! Wow! Tons of great info here! I have a project for our local sewing club that involves an "interesting closure". You've given me lots to consider. Thanks! This is outstandingly helpful, thank you!